The US ambassador to the Philippines has expressed willingness to review the 67-year-old Mutual Defense Treaty between Washington and Manila. 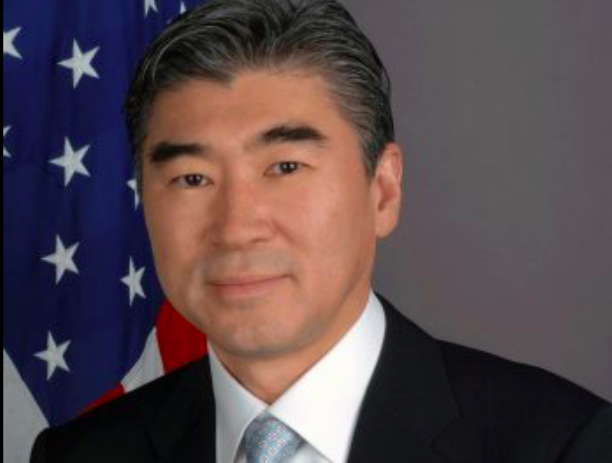 “If there are any adjustments that would be useful, certainly we would welcome an opportunity to make adjustments,” Ambassador Sung Kim told reporters at the US-Philippines Think Tank Conference in Makati City today (Thursday, February 7). The envoy acknowledged the need to go over an agreement as “important” and as “complicated” as the MDT so as to adapt to the evolving circumstances. “We would welcome taking a close look at the treaty to see whether we can make any adjustments to make it even better than what it is now,” he said. The 1951 MDT is the country’s only defence pact with another nation. The possibility of reviewing the treaty was first raised by Defense Secretary Delfin Lorenzana last December. He said he had directed lawyers from his department to look into the matter, with the objective to “maintain it, strengthen it or scrap it”. Foreign Affairs Secretary Teodoro Locsin, in a message delivered by Undersecretary Enrique Manalo, said the Philippines-US defence and security cooperation remained “strong and robust”. As treaty allies, Locsin emphasised that the militaries of both countries were continuing to work closely together, particularly in addressing non-traditional security matters, such as fighting the drug trade and terrorism. Ambassador Kim also said today that he was positive that Washington and Manila could forge a free trade agreement. “Both sides are continuing discussions on how best to move forward in expanding the bilateral relationship,” he said. US goods exported to the Philippines amounted to $8.3 billion, while imports from the Philippines totalled $10 billion, according to a 2017 report of the Office of the United States Trade Representative. The Philippines was the United States’ 31st largest goods export market in 2016. After reading his idiotic statement–“maintain it, strengthen it or scrap it” –about the treaty, it is not surprising that the so-called Defense Secretary has become the Surrender Secretary. –landed military planes in our airports (in violation of our Constitution). Lorenzana and Duterte meekly submit to the Philippines’ worst enemy, while they push away the Philippines’ best friend. Would you mind reading the history between the Philippines and the United States please? Start with the Colonization war, you know the one that was that was started by a US soldier killing a Filipino soldier in the San Juan bridge, I believe it’s in 1901? Here’s the good one, would you mind looking at the Parity Agreement that was rammed down the throat of the Philippines by the USA? Would you like me to go on? You are do damn brainwashed in the belief that the USA is so Benevolent to the Philippines. Do you not know that the USA’s best friend is it’s own Self Interest? So why can’t the Philippines? or any other country for that matter? So Mr. Anonymous says, what do you propose, for the Philippines to go to war with China? Do you really think the USA will be there for the Philippines? When did the USA became the Philippines’ best friend? pidro is stuck in 1901. The USA has been The Number One Best Friend Of The Philippines for the past 70 years in a row. 1) Complete surrender to China. Vietnam, Indonesia, Malaysia and others have successfully pushed back against the Bullies of Beijing. But Duterte likes being a lapdog. The USA has built 1000s of hospitals, roads, schools, and bridges here. The USA has given far more aid to the Philippines than anyone else has. The USA has signed a treaty to defend the Philippines from bullies like pidro’s friend China, and the US has kept their end of the deal faithfully. Despite the irrational, nasty, anti-USA childish temper tantrums by the world’s oldest toddler, President Duterte.